Lakewood Auto Body isn’t just a shop that can take care of your auto body repair needs, we also specialize in auto mechanical repair as well. This gives us the flexibility in being a one-stop shop for any car repair service needs you might have. Andy Mueller runs our mechanic shop. With his passion and gift for the auto mechanic industry, Andy also brings more experience than most. He started working on auto mechanics when he was eight years old with his father, our founder. He had rebuilt an entire engine on his own by the time he was 13 years old. 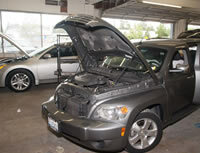 He currently holds an I-Car certification and is Lakewood Auto Body’s car repair service specialist. 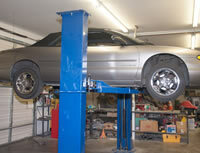 Our mechanic shop is outfitted with top end tools and equipment as well as having two hydraulic lifts that make working on a cars undercarriage a breeze. With our mechanic shop in the same building as our auto body repair shop, we can not only provide top quality repair to any damage that your car’s exterior or frame might have sustained, but we can also repair any damage to the engine, drive system, wheels, brakes, suspension, steering system, exhaust, cooling system, and even your air conditioning system. Don’t get fooled by another company with second-rate prices that claims to take care of you, but when they’re done, they tell you that you need to bring your car to an auto mechanic to finish the job before your car is drivable. Bring your car to Lakewood Auto Body where our commitment to you doesn’t end when you hand us the check. All of our mechanic shop repairs are still honored under our lifetime warrantee and our 100% satisfaction guarantee. When you bring your car into our auto mechanic, you’re trusting our family with your personal vehicle. We take this as another challenge to step up to the plate and earn your trust as another life long customer. A challenge that we take seriously here at Lakewood Auto Body, and we wont let you down. Don’t trust your family’s safety in a car that was repaired by some cut-rate company. Call someone you can trust to repair your car right the first time and never cut corners. Call Lakewood Auto Body today!